School Theft Prevention's drop boxes include with convenient mounting holes for easy wall, floor or under counter installation. Some of our boxes are available with dual locks, keyed differently, for maximum security. If you need multiple boxes, keyed alike, please let us know. 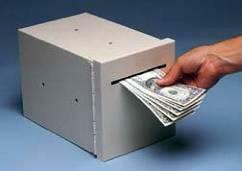 Pusher bar ensures currency is fully deposited into box.